Obama’s war on Syria rages. Opposition forces are divided. Kofi Annan’s March 2012 six-point plan failed. Three months later, so did Geneva I.
June 2012 talks were called a “last ditch effort” to halt violence. Similar headlines followed Annan’s plan. Fighting rages daily. Obama bears full responsibility. He deplores peace. He wants regime change. He’s supporting proxy death squads. He has been all along. They target Assad loyalists. Dozens of innocent civilians die daily. Assad’s wrongfully blamed for their crimes. Nothing suggests change ahead. Geneva I talks included America, Russia, China, Britain, France, Turkey, Iraq (Chair of the Summit of the League of Arab States), Kuwait (Chair of the Council of Foreign Ministers of the League of Arab States), and Qatar (Chair of the Arab Follow-up Committee on Syria of the League of Arab States). Foreign Affairs and Security Policy High Representative Catherine Ashton attended. So did then UN/Arab League Envoy for Syria Kofi Annan. Agreed on steps, measures, guideline and principles failed to resolve conflict. Will Geneva II be different? It’s hard imagining how. On Sunday, Arab League Secretary-General Nabil Elaraby said talks are scheduled for November 23 and 24. At the same time, UN/League Special Envoy to Syria, Lakhdar Brahimi, said no date is confirmed. Many obstacles remain. “I will visit a number of regional countries to know their stances and opinions on the conference to end the crisis in Syria and halt the war through a cease-fire or at least decreasing it,” he said. Syrian National Council (SNC) spokesman Najib Ghadbian earlier said some opposition forces won’t participate. Elements refusing say attending depends on Assad stepping down. It’s unclear which opposition groups will participate. It’s uncertain if any will. It’s unknown if Geneva II will be held as planned. It was initially scheduled for June. Now it’s November. Perhaps further delays will follow. Syrian Information Minister Omran al-Zoubi said his government will attend with no preconditions. Resolving conflict requires committed peace partners. It demands reversing longstanding US policy. Syria won’t negotiate with terrorists or Takfiris (Muslims accusing others of apostasy). “Political solution has been the original choice for the Syrian government since the beginning of aggression,” al-Zoubi added. Syria prioritizes it. On Monday, US Deputy Secretary of State William Burns met with Russia’s Special Envoy to the Middle East, Deputy Foreign Minister Mikhail Bogdanov. They did so in Moscow. At issue is wanting to negotiate from strength. Opposition elements are no match against Syria’s superior military. Sabra wants direct US intervention. Perhaps later. Not now. Without it, opposition forces have no chance to advance their objectives. Car bombings and other terror tactics continue daily. Innocent civilians die. Others are abducted, tortured and murdered. Syrians deplore what’s happening. They want nothing to do with belligerent anti-government elements. They want no one interfering with their right to choose who’ll lead them. 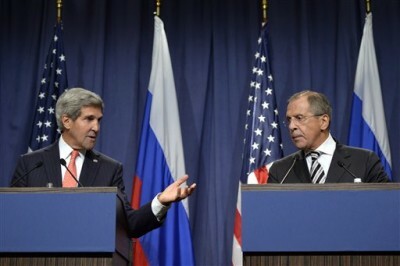 Washington assumed responsibility for assuring opposition participation, said Lavrov. “Our partners said they would succeed in gathering all parties to take part in the conference under the auspices of the National Coalition,” he explained. A Russian Foreign Ministry statement expressed concern about opposition elements discussing Geneva II separately. On Tuesday, Western and Arab countries will meet with opposition elements. They’ll do so in London. Opposition elements plan holding separate discussions in Istanbul. Doing so indicates internal divisions. Russia’s gone all out for peaceful conflict resolution. It’s done so since conflict began. Washington obstructs it. Nothing suggests policy change now. Direct and indirect US funding, arming, training and directing insurgents continue. Doing so reveals America’s real intentions. They exclude peaceful conflict resolution. Obama didn’t wage war to end it. Talks won’t change longstanding US regime change plans. Previous ones failed for that reason. Don’t expect this time to be different.